allowing you to get new partners for your structure without inviting them personally! Tens of thousands of people from all over the world visit our website daily. of the participants who have activated the Business Machine service. are made WITHOUT personal recommendations! Do you want to put them to your structure? Just activate the BUSINESS MACHINE! The connection price of 1 Place for 30 days makes $50. The number of participants connected at the same time to the "Business Machine" service is limited. to the Business Machine service is limited by the set value. until one or more places are free. 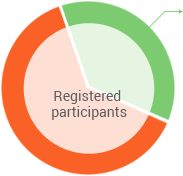 and get new registrations more often than other participants. We will fully reimburse you for the cost of each "Business Machine" activation!